There are a not many genuine drift dives in NSW. You can do the Macleay River at South West Rocks, the Leap to Steps at Kurnell or Fly Point to the Sewerage Pipe at Nelson Bay. Another dive, one that is probably done more often than any of the above, is the Swansea Channel Drift. 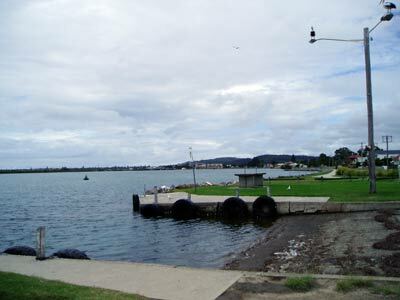 Lake Macquarie is the largest saltwater lake in Australia. It is located to the north of the New South Wales Central Coast and on the southern outskirts of Newcastle. The lake is connected to the Pacific Ocean by a channel that is crossed by the Pacific Highway at Swansea. The highway was the main link from Sydney to Brisbane until the late 1980s when a new section of freeway bypassed the area. About the same time, the single bridge across the channel was duplicated (a bit late considering the delays encountered here before). The water from the ocean runs in and out of the lake with the tides. The piles of the two bridges, as well as the remains of older bridges (two I think), provide a home to an incredible amount of fishlife as the water rushes past. Of course, it is not possible to dive under the bridge during the flow of the tides (although you can do a drift dive past the bridge). There is a way to dive the bridge and this is to do it at slack tide (high tide). The tide here peaks approximately two and a half hours after Fort Denison (Sydney Harbour) high tides. See the Swansea Bridge page for more information about the bridge dive. The drift dive can be done on either an incoming or outgoing tide, although I would suggest that incoming tides produce the best visibility. You can start this at the same location as the bridge dive (that is from what was the old punt ramp located on the southern (Swansea) side of the channel and the western side of the old bridge - it is now a new ramp) or from the eastern side of the bridge. The advantage of the eastern side is that you have a slightly longer dive and you can dive under a bit of the bridge. I will describe the longer dive. Coming from Sydney, get in the right lane as you come out of the roundabout coming into Swansea and once past the traffic lights, get into the right turn lane and turn right into Peel Street, this is immediately before the highway crosses the channel. This is probably not sign posted as it is at first just a short bit of about 20 metres between the northern and southern bound lanes of the Pacific Highway. Go straight across the southbound lane and you will see a lane on your left. Take this and it leads into the car park of the Swansea RSL Club. Go in as far as you can and find a parking spot as close to the water as possible. You will see that there are two wharves, both are good entry points. You will need two vehicles to do this dive or you will have a long walk back to get your car. Once you have unloaded all your gear from the cars, take at least two cars and backtrack to Peel Street and then cross the highway and turn right towards Newcastle. Immediately turn left and you will pass the Aqua Zero Dive Shop and the Swansea Bridge dive starting point. Follow the edge of the channel as far as you can (Belmont Street, then Channel Street) and the road turns to the left into Wallarah Street. You will see a small boat ramp as you turn. This is your ending point. About 50 metres along Wallarah Street, turn right into Park Street and then right again and park one car to the north of the ramp. Return back to the RSL Club car park (you cannot use the same streets but go right to the end of Park Street, right and then left and at the end turn left and then take any street to the right except the first. The next street is Lake Street, turn left and this will take you back to the traffic lights on the Pacific Highway. Turn left and then right and you are back in Peel Street. As I have indicated, high tide here is about 2.5 hours after Sydney high tide, so if you enter the water anytime from about one hour before Sydney high tide to two hours after you will have a successful dive. It is approximately 1500 metres from the RSL Club to the boat ramp. On an incoming 1.4 metre tide and it took us 39 minutes to travel the distance (we actually ended up about 40 metres past the ramp). Gear up and enter the water from one of the wharves. You will need to enter in buddy pairs with little time between or you will get separated straight away. Drop to the bottom and start swimming out into the channel, away from the rocks. This will take you to the bridge and you will get into the second or perhaps third (main) span. After two or three minutes you will see parts of the current and old bridges. There are pylons lying on the sand, pipes crossing the channel and even shopping trolleys. Around the bridge pylons you will see huge numbers of fish. The first species are normally luderick and bream and there are normally hundreds of each, excellent in size, swimming in between the pylons. You may be able to get a handhold on part of the bridge to stop and have a look, but make sure your buddy does as well. Watch your head as you continue as you you do not want to crash into the pipes and other horizontal parts of the bridge. Within another minute or so you will be past the bridge and the depth which was down to 10 metres will come to 6 metres. This happens pretty quick and you will need to dump air from your BCD, exhale and try to slow yourself down as your dive computer will be beeping at you like mad. You can try digging your hand into the sand to slow yourself. This is the first of at least 20 "sand dunes" that you will go over on this dive. The bottom is not flat, with the sand building up into dunes or hills every 75 metres or so. As you go over some of these dunes, you may experience a lessened current or even an eddying effect. After you pass the bridge, swim back to your left till you reach the rocks. Try to stay in touch with the rocks as this will mean that you do not inadvertently end up with you surfacing in the middle of the channel (or even the opposite side). The contour of the bottom of this dive changes all the time. At times the depth drops back to 10 metres, comes up a couple of metres, drops back to 10 and repeats this a couple of times. At other times, it will drop to 12 metres, come back up to 8 metres and then gradually drop to 9 metres over five minutes before dropping suddenly to 12 metres. As you travel, keep an eye out for huge flathead on the sand, whiting and kingfish in the open water. Over the rocks look for luderick and bream as well as smaller things like firefish, pipefish and small tropical species. One one dive, after a couple of dunes the depth dropped to 12 metres and stayed at this depth for two minutes (with rises to 8 metres) and then dropped over 2.5 minutes to almost 14 metres. The depth cames back up to 8, dropped to 11, up to 9, down to 12.5 and then up and down around 10 metres. On another dive, it only gradually dropped a metre with only small ups and downs before dropping to 12 metres. This is the same spot as at the end of the last paragraph. You will have travelled about 750 metres and been in the water 20 minutes. The depth now starts to rise and over the next 3 to 7 minutes comes up to 4 to 5 metres before dropping back to 5 and 6 metres. It stays this way for 8 minutes and then you will rise to 3 to 4 metres. The rocky reef will disappear and you will see sea grasses. This is about 200 to 300 metres from the ramp. After about another 5 or so minutes you will see a lot of car tyres and an axle or two. In this area, you will notice that the current has dropped right off and the rock wall has moved off in a sort of bay. In fact, at times there can be a backeddy here and you may need to swim to keep going. 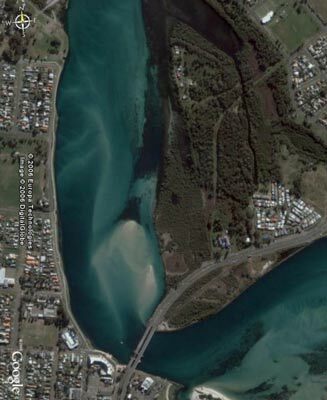 This "bay" is opposite the northern most houses in the satellite photograph above. When you get back in the current, start coming up and you should be right near the boat ramp. Of course, you will need to listen carefully for boats coming and going from the ramp and look out for boats as you ascend. Do not worry if you have gone too far, it is relatively easy to exit along the wall and it is probably safer here. Things that can be seen on the dive include at least three pushbike frames, chairs, car parts and the remains of what appear to be fibreglass boats. Dive time used to be from 30 to 45 minutes, depending on the strength of the current. Hopwever, in October 2006 after the work was done on the bridge, it only took us 28 minutes to do the whole dive, even though it was a low 1.5 metre tide. In 2007 on a 1.9 metre high it took 35 minutes. I still cannot figure it out! There is a dive shop, Aqua Zero, right next to the bridge for airfills before or after the dive. This dive site is only two hours from Sydney (even less from the northern side) and can easily be done as a day trip. Highly recommended.